The cake, the service, the love and energy put into our baby shower far surpassed any expectation I could have created. Debbie is a real gem and she has the gift of capturing the vision. She made us a delicious 3 tier cake and I am dreaming for more right now. 2 of the tiers were Lemon BlackBerry and the other one was a Vegan Chocalate. Both were so delicious. The vegan chocolate was moist and rich. I probably didn't need to announce that it was vegan became one would have never known. The lemon oh the lemon that was my favorite!!!! Lemon desserts will always have my heart, but this one has definitely left a lasting impression. I contacted Deb only 2 1/2 weeks before our event and I was surprised she accepted the task. We ordered a small 2 tier geode cake with fondant. It turned out beautifully and just what my daughter wanted. Deb made the geodes that were used as decorations for the cake and they were beautiful. 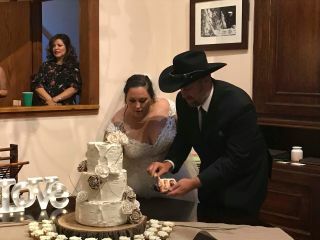 She delivered the cake on time and it was delicious! Overall it was a exceptional experience. Thank you Debbie!! 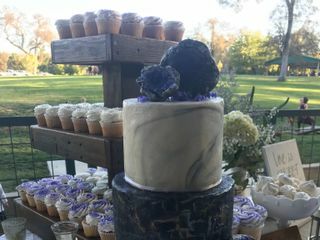 I love doing geode cakes! It was a pleasure. Sherri. Did a fabulous job of pulling off a beautiful wedding! So many cute well thought out details. Our cake was so delicious and looked exactly how we imagined!! Very beautiful! Highly recommend! Amazing! Out cake was perfect and tasted even better! We would highly recommend! Our cake came out better than we could have imagined and it tasted great! We still get compliments on how amazing it was! 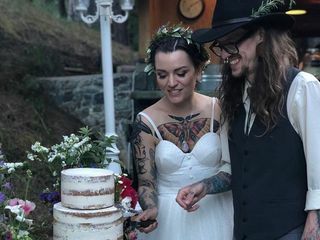 I loved making Hannah and Jason’s realistic wood stump wedding cake ! Hannah and her tribe of women (3 generations) were so fun to talk with at her cake tasting! Debbie was such a wonderful person to work with! We asked her to make two separate vegan cakes, and vegan cookies. The main cake was a lemon, vanilla, and lavender cake. All I can say is that it was incredible, and most people couldn’t believe it was vegan. The second was a gluten free blueberry and lemon “cheesecake”, and it was light, refreshing, and delicious for our gluten free guests. 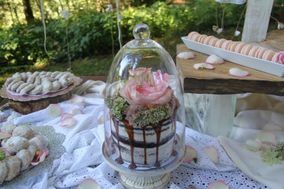 We gave debbbie our vision for a flower and herb themed wedding, and she made it a reality through her desserts. I highly recommend her! Deb created a gorgeous wedding cake and sweet tables for our wedding and reception. Truly an artist with her creative dessert offerings and wonderful flavors. Thank you, Deb, for the excellent service and treats, we wish you had a local shop we could visit to purchase the goodies you make. Definitely book Deb! After realizing that me planning to do my own wedding cake was a bad idea I reached out to Deb. Deb not only got us in last minute she provided a cake that was everything I could have hoped for and tasted even better than I could have imagined! You will not be disappointed. Thank you so much, Deb!!! Thank you Kristin! It was a pleasure! Your little naked cake was very sweet and pretty. 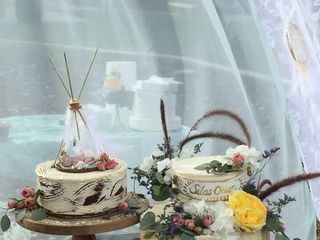 The props from Wild and Lovely Events created lovely romantic vignette..... hiring pros makes a difference in your overall event and enjoyment! We all love to hear that we helped make your dreams come true! OMG where do I start....everything about Debbie's art is amazing, from the delicious cake to the spectacular look of the cake she made for my husband and I for our wedding day. Her attention to detail is marvelous and gave my cake that special something all of us brides want. It also helps she is very easy to work with and one of the sweetest personas I've ever met. Mayra believed in the power of a fairytale cake and I was so excited with the prospect of making it! The wait included a Chang in date with the birth of an unexpected bundle of joy and stormy morning on the wedding day. As I drove to her lovely Park Winters venue, the clouds had subsided The sun shone brightly and everything was perfect! 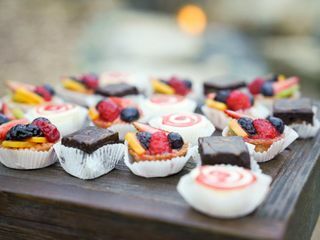 Our venue first recommended Debbie for our wedding cake, then we met her at a wedding fair and her cakes were AMAZING! One taste and I was sold. I knew I wanted our wedding cake to be one of Debbie's creations. When we met with her for our cake tasting, each cake was delicious. It was so hard to choose! Debbie was so sweet as my fiance and I were tasting each cake. We ended up choosing a Chocolate Cappuccino and Lemon Raspberry. At the reception, everyone raved about the cake! The best part that Debbie created a cake top for us to take up for our one year anniversary! It was a complete surprise and so sweet of Debbie! Debbie thank you so much for the delicious cake!!! It was delicious! Our cake was amazing! We don't even really like most cake, but this one was so moist and not overwhelmingly sweet. It was tasty and beautiful! Cakes don't need to be overly sweet. In fact, too much sugar drowns the shuttle flavors of cake and fillings, fruity or chocolate. As an experienced pastry chef. I strive for a complimentary balance of flavors and texture. 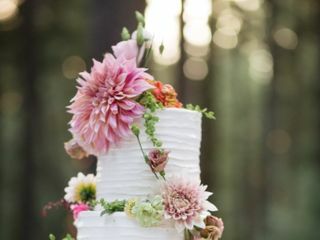 Wedding cakes are the best cakes of a lifetime and are meant to be fantastic inside and out! Debbie's cakes are amazing! They taste like a dream, and are above and beyond anything else I sampled in the area. I ordered the tres leches with a tropical fruit salsa for my late summer wedding, and my guests raved about it. Plus it's fun to know Debbie has made cakes for Oprah and several US Presidents! Amazing does not even begin to describe the cake we got from Debbie for our wedding; Our cake was a literal work of art! She listened to our every desire and provided us with a cake that was not only beautiful, but DELICIOUS! To give you an idea, my hubby's lunch and dinner the day after our wedding were pieces of her cake. For those interested, the flavor we chose was Candy Bar. Additionally, her pricing is very affordable. We will definitely be asking her to make a cake or dessert for us for other special events in the future. I feel you need more proof, check her out on Instagram at Idosbydeb...You will not be disappointed! I Do's by Deb made a beautiful cake for Sierra Nevada Memorial Hospital Foundation's Starry, Starry Nights Event! She was very easy to work with and very professional. We loved Deb! She is a pleasure to work with. She was flexible in meeting us in the bay area for our cake tasting which is a MUST. All her flavors are perfection and I surprised myself by going with the tres leches option. It is the best tres leches I've had yet and our guests RAVED about the cake!! Deb also listened to our needs, provided us with a number of recommendations/options, and didn't pressure us to go in any one direction. Made the process an enjoyable one. On top of that - the cake looked gorgeous! I was happy to meet with Vanessa and Jared in the Bay Area which I often visit. I also agree with her about my Tres Letches which has been perfected over many years! Thinking about it makes me want some right now! Flexibility is key and it is fun to mix business with pleasure! Debby did a great job at working with us to zero in on the look and feel of the cake we wanted. Also, the cake was amazing! We received a lot compliments from our guest about the cake. I loved the classy minimalist theme of this Lake Tahoe forest wedding cake. It was fun to capture the elegant simplicity that Beth was dreaming of. Deb was so amazing to work with and the cake was so delicious and looked exactly like I️ had dreamed it would! She did an amazing job and I’d definitely recommend her to anyone! Debbie made the cake for my parent's 60th anniversary party. My mom has been baking cakes for me and my 3 sisters (and so many other family members and friends) since we were born so we wanted to make sure we had a special cake for their big day. Debbie did not disappoint. My parents LOVED the cake and Debbie even used their homemade limoncello in the frosting. Her cakes look as good as they taste and she's a pleasure to work with. You should say "I do" to Deb! I searched for only Debbie to make my wedding cake. She made my brother's cake and it was the best tasting wedding cake I had ever tasted. I ordered small desserts from her as well and she performed miracles when my florist completely messed up what I wanted for the cake flowers. She took them all apart and made the cake table amazing. Thank you Debbie!! I recommend her to anyone and the almond cake is a must to try!! 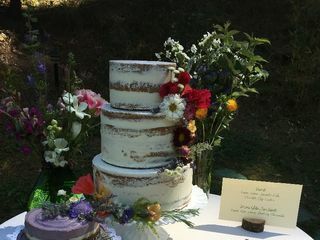 I made Monika’s brothers wedding cake around 10 years ago when I had my business “Debbie Does Dessert” in the Bay Area. A friend of mine overheard her talking at a bank about what ever happened to Debbie Does Dessert because she wanted a wedding cake from me. My friend gave her my phone number and serendipity played it’s course. That’s what I mean when I say I strive to create sweet memories long after the event! It was an honor to go back to the Bay and make Monikas vision come to fruition. Debbie is friendly and professional and (best of all) her cakes are delicious! Deb did a fantastic job designing our cake and dessert table for our wedding. The cake was absolutely beautiful and tasty and so were the desserts! I receive so many compliments about how beautiful our cake was and how fantastic the desserts tasted. Deb was so easy to work with and is full of creativity. I highly recommend using Deb for all wedding cakes and wedding desserts. She does an amazing job! You will not be disappointed. Had a fabulous time working with Debbie! She was recommended through our reception vendor. She worked it us on pricing and everything looked and tasted amazing! She went above and beyond on the presentation of our dessert station. Deb was my consultant when I opened my Dessert Bar restaurant and catering business. She has extensive experience and knowledge in baking and I would recommend her to anyone as an amazing consultant or to create your very own cake for your special event! I've attached some pics of some of our Christmas fun last year too :). Thanks Tammy, I was just thinking about holiday desserts and how much fun it is to design retail dessert lines! Debbie was an absolute dream to have on our wedding day. She made our vision come to life, her creativity was so greatly praised, and her love for her wedding inspirations is undeniable.